I’m in a pub in Clunes and Tiges-Pies is finally about to kick off. Around me, a small but quality group of my Tiger mates and laissez-faire locals lean forward in their seats. A message appears on screen and for once it’s not betting odds – the Foxtel IQ box is going to shut off in 60 seconds due to lack of input. Pandemonium. All of this is NOT how our day was supposed to go. It’s the annual girls’ weekend. We’d planned it for months. As soon as the fixture came out, actually. The three of us are all Tigers and we like to watch a match together during our weekend retreat, one that we wouldn’t want to attend in person. Collingwood-Tiges fits the bill. Nobody wants to endure a potential Pies victory in person. At the time we hadn’t realised just how likely that was. Nobody could have predicted the Pies would be third on the ladder. It’s a danger game. But that’s OK, the three of us would endure it together, with a suitable amount of alcohol courtesy of a Foxtel pub. This, too, had been planned months in advance. Kate had rung the Farmers Arms in Creswick to check they had Foxtel before she booked the B&B. All good. We gathered from our homes in Barwon Heads (Kate), Castlemaine (Jane) and Melbourne (me). We were off to the match in good time; the pub a short stroll away. Our regular footy-going mate Cambo, barred from the girls’ weekend by virtue of, well, not being a girl, was texting us updates from the ’G to get us in the mood. But our planning was for naught; in the intervening months the Arms had ditched its Foxtel subscription. Not one hotel in Creswick was showing the game. Did we have a plan B? No we did not. Jane suggested Clunes; famous as a book town, surely it would have a classy pub for all those bibliophiles. Impeccable logic. We legged it back to the cars, narrowly avoiding a freshly eviscerated rat with its entrails all over the path (“Did you read them? Will we win?” asks Cambo – no time for that), and in the kind of everyday heroism that isn’t feted enough, Kate volunteered to be the designated driver. The downside to this is her car – it’s a two-door hatchback so ancient, it doesn’t have central locking nor indeed, at this moment, petrol. Fortunately Jane was prepared to contort herself into the back seat, the petrol station was busy but we still had time, and we were soon gazing upon the National Hotel, Clunes. As it transpires classy wasn’t quite the right word – but you could say historic, cosy and welcoming. Open fire. Best of all they’d be showing the match on an enormous screen. And we were still in time for some pre-match. “Grimes and Astbury need to know that they have to play honestly or they’ll be scored against,” opined Garry Lyon. I revised my enthusiasm for the pre-match. There were only four older men in the front bar (to be fair, we’re no spring chickens ourselves), reminding me strangely of the two old men in the box on the Muppets. This left John the bartender plenty of time to look after us – that is, when he wasn’t eating his late breakfast, which consists largely of chips. He got us set up with a good view and lunch. The steak was excellent. Get yourself to the National, people. John does a good line in bartender banter too, so all in all, we’d struck it lucky. ’G correspondent Cambo reported he’d just seen an older gent with a Collingwood lanyard that said ‘crack a giant woody’. The gent said someone gave it to him and he thought it was a drink. Also, people in the Southern Stand were apparently choking on the yellow and purple smoke marking Richmond’s support of the Alannah and Madeleine Foundation. Maybe they should have thought a bit more about that one. In the bar, one of our gents said he was off to watch the local footy, Hepburn versus Clunes. “Mate, I could beat Clunes and I haven’t played for ten years,” said John. Two more quiet Tiger fans had joined us and now it’s game time but that alarming message has fired up, with the telly threatening to turn off due to lack of input. How much input do you want, inanimate object? John does a mad dash out back in a flurry befitting our overreaction, and all is well. In the second quarter we’re joined by a Collingwood supporter, just as they were clawing back the quarter-time deficit. We never introduce ourselves – ain’t nobody got time for that – but we get along like a house on fire. It gives us that crucial opposing view that you enjoy when they’re not being obnoxious about it. For example, when Jack Higgins kicks what is CLEARLY the goal of the year, no more entries thanks people, Mr Pie tells us immediately that it was a throw. By this time John the bartender has given way to his son, who as a Melbourne supporter is very happy to get into that debate. After some rules discussion they agree it was a throw. While we smugly wallow in the constant replays. The original lineup of four lugubrious gents has morphed into a lineup of four different lugubrious gents, all watching closely now. The evenness of the contest has sucked everyone in. Jack Riewoldt takes a strong pack mark and portly older gent #2 says, “He reminds me a bit of myself”. Debutant Baker runs across screen giving us too good a view of his terrible nascent mullet and gent #1 offers, “he looks like Ivan Maric’s love child”. That’s not the only hair action offending us, but I keep forgetting to ask the name of the Pie with the appalling blond streaks disaster. I suspect I’m meant to know it but I’ve had several drinks and have no brain cells interested in taking on the job of recognising Collingwood players. I want to hate Mason Cox, the man-mountain who is in the action with monotonous regularity, but unfortunately I have seen a lovely extended interview with him recently which showed him to be a delightful person. How infuriating. I’ve got to stop watching those interviews. I prefer blind uninformed hatred. By three-quarter time I am not remotely confident. Sure, the Pies have injury woes, but that’s pretty much their modus operandi this year and it hasn’t derailed them yet. On the other hand, the Tigers are masters of the killer last quarter. I voice this, and Mr Pie informs me that Collingwood have also mastered the fourth quarter this year. Thanks for that. I may have been a bit hasty is saying it’s good to have the opposing view. But in the end, the injuries do tell, along with Tiger determination, and we prevail. Phew. I don’t know how other Tiger supporters are going with their confidence but after a lifetime of disappointments it’s evidently going to take more than one premiership to give me unwavering belief. We chat a little with the young bartender before departing, about the problems with Clunes’ senior team. Like all country towns they have trouble retaining their juniors once they’re old enough to leave, and unlike some towns, Clunes doesn’t pay its players. He was deeply defeatist about it. It’s sad and we chat about it a bit on the way home – as country dwellers themselves with kids who play, Jane and Kate are very aware of the importance of the club in local communities. It’s borne out later when we see the results – Clunes was, as predicted, thrashed by 122 points. Another match recorded a losing score of 0.4.4. But it pales into insignificance when we hear that just twenty kilometres away a local league player has died of a heart attack during the game. So tragic for his family, the club and the town. I don’t know what it all means but it’s been special to feel briefly a part of the local community and hear about grassroots footy from the horse’s mouth. Without wishing to seem ungrateful to the Tiger boys for a hard-fought win, that’s what has really stayed with me. The day stays unexpected to the last. A lovely town, Clunes. You chose well, Mandy. I empathised with the broadcast situation. 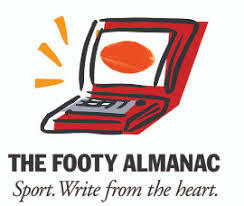 Back in 2009, I had been commissioned to write up my first final for the Almanac – Syd v Car. On the morning, Prime TV (which is Channel 7 in the country) had a catastrophic equipment failure. You couldn’t get a Channel 7 broadcast in all of Ballarat. Chaos ensued. FWIW, I don’t think Higgins threw it. Great goal. Thanks Mandy. You enjoyed your weekend and I certainly enjoyed your witty and warm recount of it. I don’t expect we’ll find a cure for the mullet any time soon. And I reckon it was a goal albeit one resulting from an exotic ball drop. Where will you be for the cats match? Thanks folks, it’s nice to enjoy a goal like that unsullied. John, looks like I won’t be at the ‘G for the Cats match although I will the week after. I guess you’ll be there, hoping to break the Tiger run? Fantastic stuff Mandy… and it’s was a sensational goal. And though claims that Higgins legally kicked a goal would be unsupported in any logical or fanciful universe… the goal somehow stands. Further proof that I know nothing.